It's 19:20 on mount Säntis, Switzerland right now. Summit Panorama A nice 360° panorama view from the summit of mount Säntis. 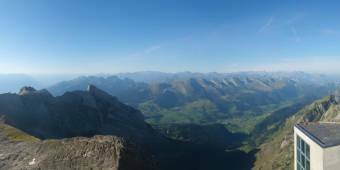 Wildhaus: roundshot 360° Panorama Oberdorf, 3.2 miles away. Wildhaus: roundshot 360° Panorama Gamsalp, 3.2 miles away. Wildhaus: roundshot 360° Panorama Berghaus Gamplüt, 3.2 miles away. Ebenalp: Webcam Chlus / Schäfler, 4 miles away. Ebenalp: roundshot 360° Panorama Luftseilbahn Wasserauen-Ebenalp AG, 4 miles away. Alt St. Johann: roundshot 360° Panorama Zinggen, 4.7 miles away. Alt St. Johann: roundshot 360° Panorama Restaurant Sellamatt, 4.7 miles away. Alt St. Johann: roundshot 360° Panorama Iltios, 4.7 miles away.